No, spite and will aren’t the names of new felines in my home. But thanks, I’ll make a note to add them to the possibilities for my next ones. Why was I doing this again? The toes on my left foot were already quietly complaining about the three mile hike they’d just endured. Why were they now clipped into a pedal to climb the asphalt to where the trail was a few minutes before and roll around the rocky bends on two wheels? Why do it again, why? Because it was there? Because when I do things I fear, I feel vindicated? Because, for whatever demented reason I like breathing through pain on a warmer-than-usual February day? No. Not at all. I don’t do cliché. Okay, yes, the teensiest bit of my focus was on those exact things. Mostly uttered on every downstroke uphill, ‘You’ll pedal up this hill, you’ll ignore what hurts, endure the heat and anything else, you’ll finish what you started, and you’ll feel better afterward, damn it!” Yeah, I hate the drill sergeant I turn into on a bike. For the most part, I was willed to pedal over those rutted, twisty-turny bends for spite. Yes, you read correctly. For spite. I know. Spite can rot your heart like cotton candy does to molars or what crab grass does to lawns or even what urine does to spoil pool water. (Yeah, that’s not chlorine you smell, ask your pool guy.) But spite can also work in your favor and make something good out of an unfortunate situation, much like an oyster and a pearl. One tiny grain of sand gets that oyster’s dander up but it breathes through the irritation and what comes of it is a pearl. Now, I could get into the length of time that actually takes and any mating rituals that may or may not ensue due to the sand’s irritation, but that’s not what this is about. This is an entertainment piece about spite and will. For oysters’ mating rituals, Google it or ask Siri. So, what created this spite, ill will, and angst, inside me you might ask? A few hours prior, I was attempting to rouse my lackadaisical energy with copious amounts of coffee. Call me an addict if you must. It’s my only vice. I suppose it’s possible that the amount of caffeine spiked the spite to that level but in this case, I don’t think that was the camel straw. Curse my incessant need for flavored cups of joe in the morning. I get up two hours before morning rides to have it. That way I’m not stopping anyone riding with me in order to find a restroom because that’s what happens when you combine caffeine with a female’s renal sysem. On mornings if I oversleep I’m known for creative coffee ingestion: instant coffee in my oatmeal, coffee in a water bottle, there are even a few instant coffee bags stashed in my pantry in case I don’t have water. I don’t want to think about it but I’d tuck a bag between my cheek and gums if it came to that. Don’t judge and don’t be a hater, it’s not crack. As I slugged down my coffee (sipping’s for hipsters) some inspiration wafted in on the aroma. It’s a nice day. I should do a short hike. The closest trail is two miles from my house. I got there to find no parking was available. That is to say, everyone else in Whittier had the same idea. They must all drink the same coffee. Someone was pulling out of a side stall, however, so I pulled in behind them and took their spot. I was even thoughtful and pulled all the way forward where a dumpster was so people could park behind me and I wouldn’t get bumped because no one knows how to parallel park. Now, you know those moments when you have a slice of intuition, a gut instinct, a tiny notion inside you that says maybe there’s a better choice to be made? In this case, that choice was that I could wait for someone to exit one of the other parking stalls so I might have an actual space with slanted lines. As I said above, I’d had coffee. Waiting wasn’t entertained. That notion, that intuition, that gut instinct that ever so briefly lit up my thoughts just before I locked my door and walked away should have had flashers, gun turrets, sirens, and Darth Vader’s voice attached so I wouldn’t have thumbed my nose at it like it was wearing white after Labor Day. I had my hike and did my rehab on the trail. Much better to do walking lunges and other knee tortures where I could bask in the warmth of the morning instead of being indoors. It even smelled better than a rehab gym. I breathed in and out while watching a hawk hunt down its prey, and wondered why I’d never ridden my bike on that trail. It was fairly devoid of foot traffic and not very long. On a day when I’m crunched for time it might be an ideal ride. 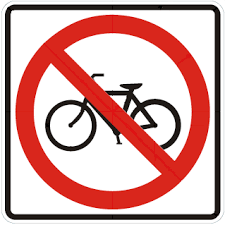 I kept seeing signs posted for no dogs, no horses, but nary a mention of no bikes. I could manage it at a later date, knowing where it ends and eventually meets up with Murphy Ranch Park. What a great idea for a ride. Then on the way back, I saw a small sign, albeit hidden behind some brush and in a roped off area: ‘No Bikes’. My excitement was quelled. Hopes were dashed. It wasn’t fair. Just a single sign with a picture of a bike crossed out. It also had a picture of a horse crossed out but certainly, the trail still held remnants of a horse having been there. Even though I imagined it’d be difficult for a ranger to ride up behind a horse and wrangle it to give its owner a fine, I wondered why a bike wasn’t permitted. But, if that’s the way it goes, then that’s the way it goes. I didn’t want a fine. I’d find somewhere else to get my knobbies dirty. The exit of the trail empties right into the entrance of the parking lot and I could see the white passenger door to my Mini with some people standing next to it pointing and laughing. My heart raced a little faster. How dare they! I clicked the remote to unlock the doors so the evil laughers would take the hint the owner was approaching and they should back up out my face before something bad happens. I stared them down and then realized why they were heckling my Mini. Nestled beneath its clean black wiper blade rested a manila parking ticket. But, why? I parked in a side stall with a box around it and a line separating a box behind it. I read the ticket. ‘Parking in a no-parking’. What? There’s no sign stating that anywhere! There was only a dumpster a foot away from my hood. I eyed the dumpster. And then recalled that notion, that gut instinct, that slice of intuition from earlier that I uncaringly, even hubristically, shoved away. On that dumpster, let me reiterate, a foot away, was a sign mocking me: ‘School bus parking only M-F 8:00 AM-11:00AM’. I brushed the dirt off my pants and glanced down at my watch: 11:20. Guilty as charged. $70 for the infraction. Oyster shell opened. Grain of sand imbedded. I started up my car and as I drove home I knew what I had to do. I had to ride the trail to amend this wrong. To soothe the suffering. To stuff the pacifier of righteous indignation into the fussy mouth of justice, which in this case was a park ranger but you get the gist. Does that make me a bad person? Just as this isn’t about oysters’ mating rituals, it’s also not about what makes a person bad, although I’m not going to argue that the lyrics to ‘Bad’ by Michael Jackson weren’t racing through my hippocampus as I pedaled around every bend and over every rutted hill. I’d like to tell you I rode with reckless abandon, screaming loudly, ‘Because I’m bad, I’m bad, you know it!’ as I rode past the posted sign with the bike crossed out, but anyone who reads this and is aware of my knee will know better. Truth is, that sign was like a burning cross and I didn’t want to get too close for fear of being branded with the image somewhere that only a coroner would see when I’m dead. However, what I can tell you is no oysters were hurt as a result of this rant. FYI, it can take three years for that pearl to appear and all because of an oyster’s spite and will to stay the path it was on regardless of something that was irritating it. Aren’t you glad it didn’t take that long for me? Categories: Humor, Popular Culture | Tags: bicycle, biking, breaking the rules, park ranger, parking ticket, parks, rehab | Permalink.